I’ve been into the fire-ravaged natural park a few times over the three weeks since we were evacuated from our village celebrations – see here for that story. It still smells of bonfire but looks somehow hauntingly beautiful. Some of the pine trees are just skeletons with no sign of the needles and cones that adorned them a few weeks ago. Others have retained their foliage but its completely blackened, but the majority still have a full complement of needles and cones that have been burned a rusty orange colour, quite like the shade of autumn. I fear they won’t revive and it will be many years before there is a green backdrop again on the mountain above Cómpeta. The fire raged over 200 acres of the Sierra Almijara and thanks to the skill and dedication of our fire fighters there was no loss of property, although there were some extremely near misses and many gardens were completely decimated. As a keen gardener I am very aware of how heart-breaking this must be – having years of work wiped out in seconds. There is still the sound of birdsong in the park, but obviously at a much lesser level and of course there is no sign of butterflies that usually abound at this time of year. And normally there are many lizards scuttling across the tracks and the occasional snake, but right now there are none to be seen. Thousands of these creatures must have died. I expected Liana to be quite upset the first time she witnessed the new conditions on one of her frequent rides, but although she appeared very interested in the blackened surroundings, she remained entirely calm and even the smell didn’t seem to faze her. Her only concern seemed to be that the grasses she normally lunges for whenever she thinks I’m not paying attention had completely disappeared. Last week we took our normal ride over the mountain tracks, passed above the town football pitch and through the Cruz del Monte urbanisation, but this weekend Liana had an early (6:30 am) breakfast so that she had time to digest her food before we set off for an 8:30 am ride on an extended route. It is so hot here now that an early start is essential and I no longer invite Roly to accompany us on longer rides, much to his indignation. So on Sunday we rode to Puerto Collado and up until that point everything to the left and the right had been destroyed. From Puerto Collado towards Casa de la Mina was more or less untouched. We took the zig-zag track up from the viewing point towards the fire hut high above Casa de la Mina, and the devastation continued until we reached higher ground and here I could see where the fire fighting aircraft had bombed the land with red coloured retardant that seemd to have stopped the fire in its tracks. I really do find this new landscape quite fascinating and seeing it from various heights gives a very different perspective. What I found most wonderful was that Mother Nature already seems to be fighting back, only small signs amongst the charred mountainsides, but (to use a financial phrase for a more literal meaning) there were signs of ‘green shoots of recovery’. 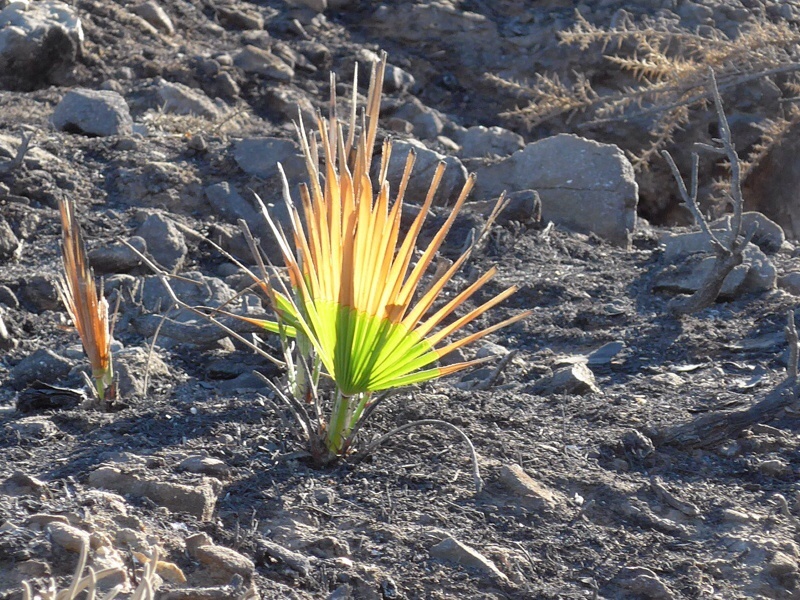 Grass was beginning to show through the charcoal of the scorched land, and a single leaf of a Washington type palm was poking through the ground, the top half damaged by fire, but the lower part obviously under the ground three weeks ago was showing its bright green colour like a beacon of hope. The investigators have declared the fire to have been deliberate, ie arson. It defies belief that anyone would want to create so much senseless damage and danger. As usual, I took lots of photos, all of them from the saddle (apart from the grass and the burned olive trunk, taken when I was walking Roly), so not much time or opportunity to frame the shots that well, but I am quite pleased with the selection I have included in the video below. I hope you will be patient if it takes a while to load – it isn’t very long, so you shouldn’t have to wait for ages, unless you have the internet speed of a slug, as we do here. I have used a new app for the video and I am quite pleased with it, other than a couple of the transitions are a bit corny, but it is a new toy, so I have a lot to discover. Let me know what you think….. 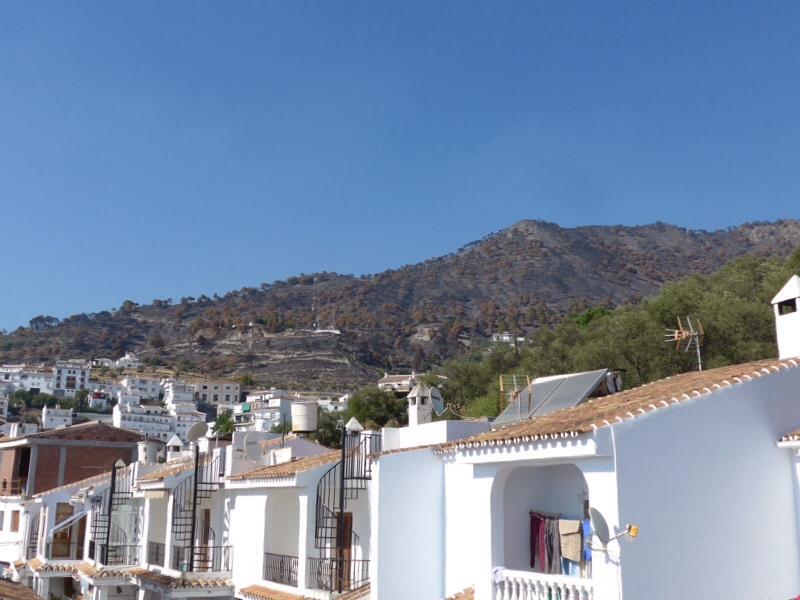 This entry was posted in A view of life, Expats in andalucia, Horse riding in the mountains of andalucia and tagged arson, Casa de la Mina, Cómpeta fire, Cruz del Monte, Expats in Andalucia, Liana, puerto Collado, Roly, Sierra Almijara. Bookmark the permalink. I so admire anyone who has such an eye for photography. I don’t. Beautiful countryside. So sad at the destruction. Thanks. More signs of life today Leona, the bush and grasses will soon be back, but not the trees I fear. Nature is persistent if nothing else. This is a fabulous video and stunning photographs. Arson. OMG. That is so sad. Great pix. Great writing. You have such journalistic skills! At least with fire…things have a wonderful way of coming back. Wonder if your horse ‘saw’ a difference. He most likely smelled a difference. The smell is really strong – I was up there again today, walking, and there is even more sign of recovery now. Incredible. I am hoping to interview a local fireman for a post sometime in the future, which I think will be really interesting. Liana was definitely aware that it was all different up there – she kept stopping to look around. Lovely video Jim, thanks for posting. It certainly gives hope for the future. Mother Nature never fails to amaze me. Green shoots of recovery, wonderful to see. Thank you for the great photos and the video. Thanks Cindy. It’s great to see some green up there, however small.